I signed up for a Christmas Blog Swap hosted by Jasmine from Sweetaholic Beauty, and was lucky enough to be paired up with Kay from BaniniBeauty, who is in the UK. My worst blog swap nightmare has occurred... The realisation that the parcel you've sent your partner is absolutely crap in comparison to what you have received. We set a budget of AUD$30, and she's clearly gone waaaay past that. She jam packed the box with a whole heap of goodies. Everything was wrapped in pretty white, snowflake covered wrapping paper. I got too excited and ripped one open before realizing I should have taken a photo... Sorry! In the box were these snowflake thingies that I thought were so pretty, so I fished them all out and am keeping them in one of my empty bellaboxes. I absolutely love everything that Kay has sent me! I told her that I'm interested in trying Asian/Korean branded stuff, as I haven't really gotten many Asian/Korean products and I knew that she has tried a whole heap and knows what's good! She sent me two masks. One by Tony Moly and the other by Etude House. I don't normally wear masks, but for some strange reason, I'm so excited to try these out!! I also received an Apple Smoothie Peeling Gel by Mizon, which is a Korean brand. I have never heard of Mizon before, but the gel smells like... apples! The description in teeny tiny writing on the box says "Natural cellulose rolls up dead skin cells, sebum, and skin wastes when rubbed. The smooth texture of gommage peeling gel works on skin mildly without irritation. Apple and sugarcane maple extracts moisturize and soothe skin after exfoliation". I don't think I have ever tried a peeling gel before, and am excited to try this out! A ginormous tub of Cranberry Joy Body Butter from The Body Shop was also included in the box of goodies Kay has sent me. The body butter smells amazing!! Kay also sent me a whole heap of lip products. From left to right, MUA Lipstick in Shade 7, Hello Kitty Lipstick in Keep It Real, The Body Shop Born Lippy Promegranate Lip Balm, Epically Epic Soap Co. Lip Balm in Fuji Apple, Etude House Dear My Blooming Lips-talk in RD304. Although all the lipsticks sent looked like really bright colours (which I don't tend to buy), I'm still excited to try them all... so much so that I don't know which one to use first! OMG She included nail polish too! I LOOOVE nail polishes, and I love these colours! Tony Moly in GS10 and Models Own in Dancing Queen. Both gorgeous colours! Kay also sent me a mascara by Lioele. It's called the Bubi Bubi Mascara in Gorgeous Black. I have heard of Lioele but have never heard about this mascara before. SO excited to try this! I love mascaras! The last makeup item she sent me is a MeMeMe Blush me! in Coral. I owned a blush in pink but didn't get much use out of it, so I sold it. But I love coral blushes, so I'm sure I'll be getting a ton of use out of this blush! Cadbury money chocolate!!!!! I thought there was only one, until I took out all FOUR! Apart from the Cadbury choccies, she sent me a whole bag full of chocolates and a lollipop, as well as a Marks & Spencer Christmas Pudding! I feel so spoilt! Thank you SO much Kay! I really feel bad because I don't think the parcel I sent you is at this level of awesome! If you have not checked out Kay's blog at BaniniBeauty, please do! 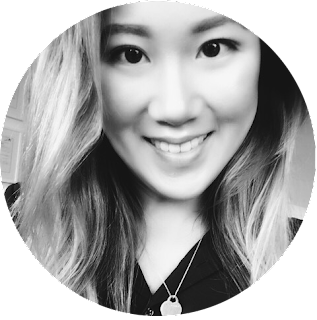 She is a fantastic blogger, and I love her reviews on Asian beauty products. AND she's ubberly generous, as can be seen in all the goodies she's sent me. Thanks again Kay, and thanks Jasmine for hosting the blog swap! Oh dear you were spoilt! She chose some absolutely gorgeous things!!! Haha next swap, I'm rigging it so I get Kay ;) jks! Haha wouldn't blame you if you rigged it to get Kay! I really want to try Etude House lipsticks, the packaging is so cute! And that snowman is adorable! Haha it makes me really happy too. Do you like owls? I know right! Snowman is absolutely adorable! How cute! I can't wait til my girl receives her, and I receive mine!!! She did send me loads of amazing things. I feel so spoilt! I'm glad you liked the items! Technically I did spend close to the budget because some items were on offer like 3 for 2 or half price and so on so I could get u loads for that money! You mentioned that you have acne scarring and oily skin like mine so I chose the peeling gel, since if used regularly can help reduce the appearance of them! Hey Abby, quick question if you don't mind? You did a Sephora haul recently and used your credit card + hop shop go. I was wondering how you were able to use a Aussie credit card when Sephora doesn't take international cards? Sorry for intruding in on this post! Thanks for the offer but I wanted to claim the free birthday gift :) It's my friends birthday so i was going to do an order through their Sephora account :P Damn.. maybe I should cancel my credit card and get the one you have :) Thanks for your help! No worries! The Fresh lip balms are amazing! Have to warn you that the 28 degrees card is quite hard to get. Tried to apply it with my mums and dad's details but they rejected them! P.S. You need to get twitter so we can chat!